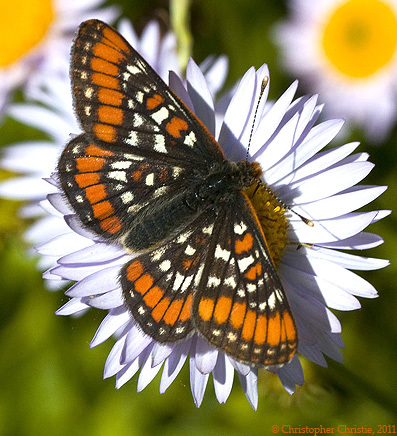 Identification: Upperside of both wings is dark brown with a wide orange-red submarginal band; other spots are orange-red and white. Life History: Adults fly slowly and roost singly in conifers. 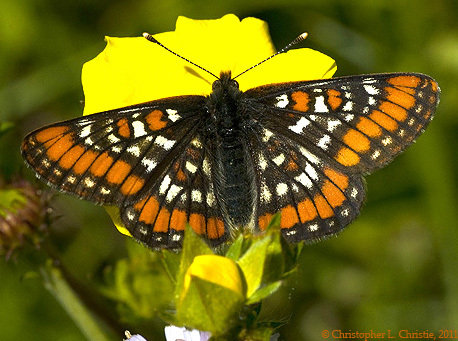 Males patrol around tops of trees or tall flowers for females. Eggs are laid in batches on undersides of sunlit leaves so that the warmth helps the eggs develop faster. Young caterpillars live together in a silk nest, feeding on leaves and leaf buds. At low elevations, fourth-stage caterpillars hibernate. 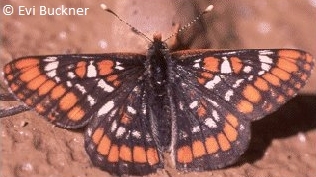 Populations at higher elevations require two years to complete development; during the first winter, young caterpillars hibernate after feeding for two weeks; during the second winter, fifth-stage caterpillars hibernate. Caterpillar Hosts: Plants of the honeysuckle family (Caprifoliaceae) including twin-berry honeysuckle (Lonicera involucrata) and snowberry (Symphoricarpus albus); and the figwort family (Scrophulariaceae) including speedwell (Veronica wormskjoldii). Habitat: Open, moist conifer forests; moist meadows; streamsides. Range: Very local in southwest Alberta, eastern Idaho, Montana, and western Wyoming. Management Needs: Ensure presence of sufficient habitats in appropriate successional condition. Some captive propagation and reintroduction may be necessary.